The brother of Cornelis Saftleven, Herman settled in Utrecht in circa 1632, and, although he only became a citizen of the city in 1659, it was to be his adopted home for the rest of his life. 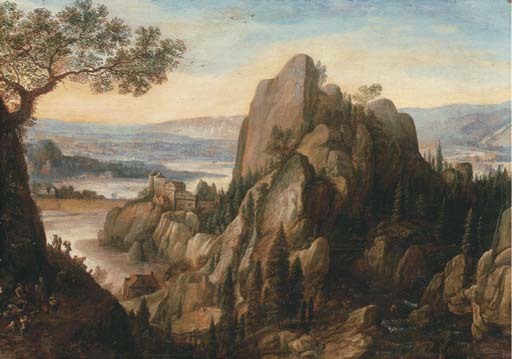 During the first part of his career Herman adopted a variety of styles, including interior scenes painted in collaboration with his brother, and landscapes influenced variously by Pieter Molyn, Jan van Goyen, Jan Both and Cornelis Poelenburgh (with whom on occasion he also collaborated). From the mid-1640s, however, his focus turned from Italianate scenes towards northern views, a change probably caused at least in part by a visit in 1644 to the eastern Dutch province of Gelderland; in 1651 he made a second visit to the eastern Netherlands, travelling to Arnhem and Cleves, and from there down the Rhine to Bingen, near Mainz, the scenery of which region seems greatly to have influenced him. From around that period he concentrated on imaginary Rhineland views, such as the present work, and on topographically accurate hilly and rocky landscapes peopled with tiny figures.